Every American depends — directly or indirectly — on our system of information networks. They are increasingly the backbone of our economy and our infrastructure; our national security and our personal well-being. But it's no secret that terrorists could use our computer networks to deal us a crippling blow. We know that cyber-espionage and common crime is already on the rise. And yet while countries like China have been quick to recognize this change, for the last eight years we have been dragging our feet. As President, I'll make cyber security the top priority that it should be in the 21st century. I'll declare our cyber-infrastructure a strategic asset, and appoint a National Cyber Advisor who will report directly to me. We'll coordinate efforts across the federal government, implement a truly national cyber-security policy, and tighten standards to secure information — from the networks that power the federal government, to the networks that you use in your personal lives. That was a pretty exciting statement to hear! On February 9, 2009, (now) President Obama appointed Melissa Hathaway as Acting Senior Director for Cyberspace and charged her with performing a comprehensive review of national cyberspace security in 60 days. I interacted with Ms. Hathaway and members of her team during those 60 days (as well as before and after). From my point of view, it was a top-notch team of professionals approaching the review with a great deal of existing expertise and open minds. I saw them make a sincere effort to reach out to every possible community for input. If you're keeping count, the report was delivered on or about April 10. Then, mostly silence to those of us on the outside. Several rumors were circulated in blogs and news articles, and there was a presentation at the RSA conference that didn't really say much. The President outlined the general responsibilities and duties of this new position. It apparently will be within the National Security Staff, reporting to the NSC, but also reporting to OMB and the National Economic Council, and working with the Federal CIO, CTO and the Office of Science and Technology Policy. coordinating with state and local governments, and with the private sector, "to ensure an organized and unified response to future cyber incidents." to strengthen ties with the private sector, with an explicit mandate to not set security standards for industry. to begin a national campaign to increase awareness and cyber literacy. The President also made it clear that privacy was important, and that monitoring of private networks would not occur. There were a number of things that weren't stated that are also interesting, as well as understanding implications of what was stated. Second, the position reports to the National Economic Council and OMB. If we look back at our problems in cyber security (and I have blogged about them extensively over the last few years, and spoken about them for two decades), many of them are traceable to false economies: management deciding that short-term cost savings were more important than protecting against long-term risk. Given the current stress in the economy I don't expect any meaningful actions to be put forth that cost anything; we will still have the mindset that "cheapest must be best." Third, there was no mention of new resources. In particular, no new resources for educational initiatives or research. We can pump billions of dollars into the bank accounts of greedy financiers on Wall Street, but no significant money is available for cyber security and defense. No surprise, really, but it is important to note the "follow the money" line -- the NEC has veto power over this position, and no money is available for new initiatives outside their experience. Fourth, there was absolutely no mention made of bolstering our law enforcement community efforts. We already have laws in place and mechanisms that could be deployed if we simply had the resources and will to deploy them. No mention was made at all about anything active such as this -- all the focus was on defensive measures. Similarly, there was no mention of national-level responses to some of the havens of cyber criminals, nor of the pending changes in the Department of Defense that are being planned. Fifth, the President stated "Our pursuit of cybersecurity will not -- I repeat, will not include -- monitoring private sector networks or Internet traffic." I suspect that was more than intended to reassure the privacy advocates -- I believe it was "code" for "We will not put the NSA in charge of domestic cyber security." Maybe I'm trying to read too much into it, but this has been a touchy issue in many different communities over the last few months. There are certainly other things that might be noted about the report, but we should also note some positive aspects: the declaration that cyber is indeed a strategic national asset, that the problems are large and growing, that the existing structures don't work, that privacy is important, and that education is crucial to making the most of cyber going forward. Of course, Congress ("pro is to con as Progress is to Congress") is an important player in all this, and can either help define a better or solution or stand in the way of what needs to be done. Thus, naming a Cyberspace Coordinator is hardly the last word on what might happen. But with the perspective I have, I find it difficult to get too excited about the overall announcement. We shall see what actually happens. I've read the report through twice, and read some news articles commenting on it. These comments are "off the top" and not necessarily how I'll view all this in a week or two. But what's the role of blogging if I need to think about it for a month, first? It is important to note that the President's remarks were not the same as the report, although its issuance was certainly endorsed by the White House. The reason I note the difference is that the report identifies many problems that the President's statement does not address (in any way), and includes many "should"s that cannot be addressed by a "coordinator" who has no budget or policy authority. What is both interesting and sad is how much the new report resembles the largely-inconsequential National Plan to Secure Cyberspace issued under the Bush Administration (be sure to see the article at the link). That isn't a slam on this report -- as I wrote earlier, I think it is a good effort by a talented and dedicated team. What I mean to imply is that the earlier National Plan had some strong points too, but nothing came of it because of cost and prioritization and lack of authority. 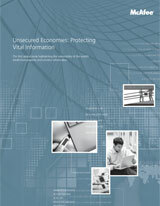 There are a number of excellent points made in this report: the international aspects, the possibility of increased liability for poor security products and pratices, the need for involvement of the private sector and local governments, the need for more education, the problems of privacy with security, and more. I was struck by a few things missing from the report. First, there was no mention of the need for more long-term, less applied research and resources to support it. This is a critical issue, as I have described here before and has been documented time and again. To its credit, the report does mention a need for better technology transfer, although this is hardly the first time that has been observed; the 2005 PITAC report "Cyber Security: A Crisis of Prioritization" included all of this (and also had minimal impact). The report had almost nothing to say about increasing resources and support for law enforcement and prosecution. This continues to puzzle me, as we have laws in place and systems that could make an impact if we only made it a priority. There is no discussion about why some previous attempts and structures -- notably DHS -- have failed to make any meaningful progress, and sometimes have actually hindered better cyber security. Maybe that would be expecting too much in this report (trying not to point fingers), but one can't help but wonder. Perhaps it is simply enough to note that no recommendations are made to locate any of the cyber responsibilities in DHS. There is some discussion of harmonizing regulations, but nothing really about reviewing the crazy-quilt laws we have covering security, privacy and response. There is one sentence in the report that suggests that seeking new legislation could make things worse, and that is true but odd to see. As an aside, I bet the discussion about thinking about liability changes for poor security practices and products -- a very reasonable suggestion -- caused a few of the economic advisors to achieve low Earth orbit. That may have been enough to set off the chain of events leading to reporting to the NEC, actually. However, it is a legitimate issue to raise, and one that works in other markets. Some of us have been suggesting for decades that it be considered, yet everyone in business wants to be held blameless for their bad decisions. Look at what has played out with the financial meltdown and TARP and you'll see the same: The businessmen and economists can destroy the country, but shouldn't be held at fault. There is discussion of the supply-chain issue but the proposed solution is basically to ensure US leadership in production -- a laudable goal, but not achievable given the current global economy. We're going to need to change some of our purchasing and vetting habits to really achieve more trustworthy systems — but that won't go over with the economists, either. There is no good discussion about defining roles among law enforcement, the military, the intelligence community, and private industry in responding to the problems. Yes, that is a snake pit and will take more than this report to describe, but the depth of the challenges could have been conveyed. As David Wagner noted in email to an USACM committee, there is no prioritization given to help a reader understand which items are critical, which items are important, and which are merely desirable. We do not have the resources to tackle all the problems first, and there is no guidance here on how to proceed. I didn't intend for this to be a long, critical post about the report and the announcement. I think that this topic is receiving Presidential attention is great. The report is really a good summary of the state of cybersecurity and needs, produced by some talented and dedicated Federal employees. However, the cynic in me fears that it will go the way of all the other fine reports -- many of which I contributed to -- including the PITAC report and the various CSTB reports; that is, it will make a small splash and then fade into the background as other issues come to the fore. Basically, I think the President had the right intentions when all this started, but the realpolitik of the White House and current events have watered them down, resulting in action that basically endorses only a slight change from the status quo. I could be wrong. I hope I'm wrong. But experience has shown that it is almost impossible to be too cynical in this area. In a year or so we can look back at this and we'll all know. But what we heard today certainly isn't what Candidate Obama promised last July. I was editing a section of my website, when I ran across a link to a paper I had forgotten that I wrote. I'm unsure how many people actually saw it then or since. I know it faded from my memory! Other than CERIAS WWW sites and the AAAS itself, a Google search reveals almost no references to it. As background, in early April of 2002, I was asked, somewhat at the last moment, to prepare a paper and some remarks on the state of information security for a forum, Technology in a Vulnerable World, held on science in the wake of 9/11. The forum was sponsored by the AAAS, and held later that month. There were interesting papers on public health, risk communication, the role of universities, and more, and all of them are available for download. My paper in the forum wasn't one of my better ones, in that it was somewhat rushed in preparing it. Also, I couldn't find good background literature for some of what I was writing. As I reread what I wrote, many of the points I raised still don't have carefully documented sources in the open literature. However, I probably could have found some published backup for items such as the counts of computer viruses had I spent a little more time and effort on it. Mea culpa; this is something I teach my students about. Despite that, I think I did capture most of the issues that were involved at the time of the forum, and I don't believe there is anything in the paper that was incorrect at that time. Why am I posting something here about that paper, One View of Protecting the National Information Infrastructure, written seven years ago? Well, as I reread it, I couldn't help but notice that it expressed some of the same themes later presented in the PITAC report, Cyber Security: A Crisis of Prioritization (2005), the NRC report Towards a Safer and More Secure Cyberspace (2007), and my recent Senate testimony (2009). Of course, many of the issues were known before I wrote my paper -- including coverage in the NRC studies Computers at Risk: Safe Computing in the Information Age (1991) , Trust in Cyberspace (1999) and Cybersecurity Today and Tomorrow (2002) (among others I should have referenced). I can find bits and pieces of the same topics going further back in time. These issues seem to be deeply ingrained. I wasn't involved in all of those cited efforts, so I'm not responsible for the repetition of the issues. Anyone with enough background who looks at the situation without a particular self-interest is going to come up with approximately the same conclusions -- including that market forces aren't solving the problem, there aren't enough resources devoted to long-term research, we don't have enough invested in education and training, we aren't doing enough in law enforcement and active defense, and we continue to spend massive amounts trying to defend legacy systems that were never designed to be secure. Given these repeated warnings, it is troubling that we have not seen any meaningful action by government to date. However, that is probably preferable to government action that makes things worse: consider DHS as one notable example (or several). Compounding the problem, too many leaders in industry are unwilling to make necessary, radical changes either, because such actions might disrupt their businesses, even if such actions are in the public good. It is one of those "tragedy of the commons" situations. Market forces have been shown to be ineffective in fixing the problems, and will actually lead to attempts to influence government against addressing urgent needs. Holding companies liable for their bad designs and mistakes, or restricting spending on items with known vulnerabilities and weaknesses would be in the public interest, but too many vendors affected would rather lobby against change than to really address the underlying problems. Those of us who have been observing this problem for so long are therefore hoping that the administration's 60 day review provides strong impetus for meaningful changes that are actually adopted by the government. Somewhat selfishly, it would be nice to know that my efforts in this direction have not been totally in vain. But even if nothing happens, there is a certain sense of purpose in continuing to play the role of Don Quixote. Sancho! Where did I leave my horse? Why is it that Demotivators® seem so appropriate when talking about cyber security or government? If you are unfamiliar with Despair.com, let me encourage you to explore the site and view the wonderfully twisted items they have for sale. In the interest of full disclosure, I have no financial interest or ties to the company, other than as a satisfied and cynical customer. On a more academic note, you can read or purchase the NRC reports cited above online via the National Academies Press website. I’d like to repeat (portions of) a theme I have been speaking about for over a decade. I’ll start by taking a long view of computing. Fifty years ago, IBM introduced the first all-transistor computer (the 7000 series). Transistors were approximately $60 apiece (in current dollars). Secondary storage was about 10 cents per byte (also in current dollars) and had a density of approximately 2000 bits per cubic inch. According to Wikipedia, a working IBM 7090 system with a full 32K of memory (the capacity of the machine) cost about $3,000,000 to purchase—over $21,000,000 in current dollars. Software, peripherals, and maintenance all cost more. Rental of a system (maintenance included) could be well over $500,000 per month (in 1958 dollars). Other vendors soon brought their own transistorized systems to market, at similar costs. These early computing systems came without an operating system. However, the costs of having such a system sit idle between jobs (and during I/O) led the field to develop operating systems that supported sharing of hardware to maximize utilization. It also led to the development of user accounts for cost accounting. And all of these soon led to development of security features to ensure that the sharing didn’t go too far, and that accounting was not disabled or corrupted. As the hardware evolved and became more capable, the software also evolved and took on new features. Costs and capabilities of computing hardware have changed by a factor of tens of millions in five decades. Currently, transistors cost less than 1/7800 of a cent apiece in modern CPU chips (Intel Itanium). Assuming I didn’t drop a decimal place, that is a drop in price by 7 orders of magnitude. Ed Lazowska made a presentation a few years ago where he indicated that the number of grains of rice harvested worldwide in 2004 was ten quintillion—10 raised to the 18th power. But in 2004, there were also ten quintillion transistors manufactured, and that number has increased faster than the rice harvest ever since. We have more transistors being produced and fielded each year than all the grains of rice harvested in all the countries of the world. Isn’t that amazing? Storage also changed drastically. We have gone from core memory to semiconductor memory. And in secondary storage we have gone from drum memory to disks to SSDs. If we look at consumer disk storage, it is now common to get storage density of better than 500Gb per cubic inch at a cost of less than $.20 per Gb (including enclosure and controller)—a price drop of nearly 8 orders of magnitude. Of course, weight, size, speed, noise, heat, power, and other factors have all also undergone major changes. To think of it another way, that same presentation by Professor Lazowska, noted that the computerized greeting cards you can buy at the store to record and play back a message to music have more computing power and memory in them than some of those multi-million $ computers of the 1950s, all for under $10. Yet, despite these incredible transformations, the operating systems, databases, languages, and more that we use are still basically the designs we came up with in the 1960s to make the best use of limited, expensive, shared equipment. More to the theme of this blog, overall information security is almost certainly worse now than it was in the 1960s. We’re still suffering from problems known for decades, and systems are still being built with intrinsic weaknesses, yet now we have more to lose with more valuable information coming online every week. Another such habit is that of trying to build every system to have the capability to perform every task. There is a general lack of awareness that security needs are different for different applications and environments; instead, people seek uniformity of OS, hardware architecture, programming languages and beyond, all with maximal flexibility and capacity. Ostensibly, this uniformity is to reduce purchase, training, and maintenance costs, but fails to take into account risks and operational needs. Such attitudes are clearly nonsensical when applied to almost any other area of technology, so it is perplexing they are still rampant in IT. For instance, imagine buying a single model of commercial speedboat and assuming it will be adequate for bass fishing, auto ferries, arctic icebreakers, Coast Guard rescues, oil tankers, and deep water naval interdiction—so long as we add on a few aftermarket items and enable a few options. Fundamentally, we understand that this is untenable and that we need to architect a vessel from the keel upwards to tailor it for specific needs, and to harden it against specific dangers. Why cannot we see the same is true for computing? Why do we not understand that the commercial platform used at home to store Aunt Bee’s pie recipes is NOT equally suitable for weapons control, health care records management, real-time utility management, storage of financial transactions, and more? Trying to support everything in one system results in huge, unwieldy software on incredibly complex hardware chips, all requiring dozens of external packages to attempt to shore up the inherent problems introduced by the complexity. Meanwhile, we require more complex hardware to support all the software, and this drives complexity, cost and power issues. The situation is unlikely to improve until we, as a society, start valuing good security and quality over the lifetime of our IT products. We need to design systems to enforce behavior within each specific configuration, not continually tinker with general systems to stop each new threat. Firewalls, IDS, antivirus, DLP and even virtual machine “must-have” products are used because the underlying systems aren’t trustworthy—as we keep discovering with increasing pain. A better approach would be to determine exactly what we want supported in each environment, build systems to those more minimal specifications only, and then ensure they are not used for anything beyond those limitations. By having a defined, crafted set of applications we want to run, it will be easier to deny execution to anything we don’t want; To use some current terminology, that’s “whitelisting” as opposed to “blacklisting.” This approach to design is also craftsmanship—using the right tools for each task at hand, as opposed to treating all problems the same because all we have is a single tool, no matter how good that tool may be. After all, you may have the finest quality multitool money can buy, with dozens of blades and screwdrivers and pliers. But you would never dream of building a house (or a government agency) using that multitool. Sure, it does a lot of things passably, but it is far from ideal for expertly doing most complex tasks. Managers will make the argument that using a single, standard component means it can be produced, acquired and operated more cheaply than if there are many different versions. That is often correct insofar as direct costs are concerned. However, it fails to include secondary costs such as reducing the costs of total failure and exposure, and reducing the cost of “bridge” and “add-on” components to make items suitable. Smaller and more directed systems need to be patched and upgraded far less often than large, all-inclusive systems because they have less to go wrong and don’t change as often. There is also a defensive benefit to the resulting diversity: attackers need to work harder to penetrate a given system because they don’t know what is running. Taken to an extreme, having a single solution also reduces or eliminates real innovation as there is no incentive for radical new approaches; with a single platform, the only viable approach is to make small, incremental changes built to the common format. This introduces a hidden burden on progress that is well understood in historical terms—radical new improvements seldom result from staying with the masses in the mainstream. Therein lies the challenge, for researchers and policy-makers. The current cyber security landscape is a major battlefield. We are under constant attack from criminals, vandals, and professional agents of governments. There is such an urgent, large-scale need to simply bring current systems up to some bare minimum that it could soak up way more resources than we have to throw at the problems. The result is that there is a huge sense of urgency to find ways to “fix” the current infrastructure. Not only is this where the bulk of the resources is going, but this flow of resources and attention also fixes the focus of our research establishment on these issues, But when this happens, there is great pressure to direct research towards the current environment, and towards projects with tangible results. Program managers are encouraged to go this way because they want to show they are good stewards of the public trust by helping solve major problems. CIOs and CTOs are less willing to try outlandish ideas, and cringe at even the notion of replacing their current infrastructure, broken as it may be. So, researchers go where the money is—tried and true, incremental, “safe” research. Some of us see how knowledge of the past combined with future research can help us have more secure systems. The challenge continues to be convincing enough people that “cheap” is not the same as “best,” and that we can afford to do better. Let’s see some real innovation in building and deploying new systems, languages, and even networks. After all, we no longer need to fit in 32K of memory on a $21 million computer. Let’s stop optimizing the wrong things, and start focusing on discovering and building the right solutions to problems rather than continuing to try to answer the same tired (and wrong) questions. We need a major sustained effort in research into new operating systems and architectures, new software engineering methods, new programming languages and systems, and more, some with a (nearly) clean-slate starting point. Small failures should be encouraged, because they indicate people are trying risky ideas. Then we need a sustained effort to transition good ideas into practice. What we have been doing in cyber security has been insane. It is past time to do something different. Of course, the US political system tends to reinforce this binary choice procedure, as we have long had only two really major parties. Parliamentary systems seem to encourage more parties, although even then there appears to be only two major ones, often oriented around the same approximate social/political poles: a conservative party, and a liberal (labor) party. What none of them say, and the media doesn’t either, is that very few of the promises can really be certain of being kept. And in large part, that is also a nature of government. The President has a limited set of powers under the Constitution. He (or she) is responsible for the execution of the laws of the United States. The President is the Commander-in-Chief of all the armed forces and is responsible for commanding them in defense of the country and upholding the law (including treaties). The President is the chief executive agent of all the various Cabinet agencies, and of a number of offices and commissions. The President appoints a large number of officials (including judges and ambassadors), but doesn’t have the power to remove many of them. Most importantly, the President does not make new laws. Laws are passed by Congress, usually with the assent of the President, although a 2/3 majority of both houses of Congress may pass laws to which the President objects. The President is then responsible for ensuring that those laws are carried out, with recourse to the Courts if there are questions. If the President fails to enforce the laws, Congress may take some punitive actions, or even impeach the President…if they have the political will. So, back to the candidates. If you listen to their speeches, they offer to change tax law, spend more on energy issues, change health care, and a number of other important domestic issues. What they don’t point out, however, is that they will have no authority as President to do most of those things! Instead, Congress will need to pass authorizing legislation that is signed by the President. The President can certainly propose that Congress enact those changes, but Congress needs to craft and pass legislation that enables the President to act, and that allocate necessary funds, and that also create/remove administrative structures that may be involved. This legislation can include whatever other items that Congress adds in to the bill, including items that may be completely unrelated to the main topic. The President then must decide whether to sign the bill and act to implement its provisions. So, the most a new President can do is to propose legislation to embody his/her campaign promises, and to work for its passage. What usually happens is that the size of the win in the election serves as a political measure of how much the population is aligned with the new President’s positions, and this can help get a particular agenda passed…or not. Of critical importance is also the issue of whether one or both houses of Congress are controlled by the same party as the new President, and by what margin. Thus, there should probably be more attention paid to the candidates running for Congress and their particular positions on important issues. In many venues, however, the majority of the attention is focused on the Presidential contest. Some other states are also dealing with contentious state initiatives, tight governor races, and other local issues that help further obscure the Congressional races. Now, how does this apply to cybersecurity, the ostensible topic of this blog? Or education? Or privacy? Or other topics we focus on here? Of course, with the economy in such sad shape, and some of the other severe problems being faced by the U.S., one might ask whether cyber should be a priority for the new President. I would answer yes, because the problems are already here and severe (although not as obvious as some of the other problems), and it will take years of major effort simply to keep even with the current sad status. The problems in cyber cannot be fixed in a crash effort devoted at any future time, and until they are addressed they will be a drain on the economy (in 2006, the FBI estimated the loss to computer crime in the US to be $67 billion—almost 10% of the recent economic bailout), and a threat to national security. Thus, deferring action on these issues will only make the situation worse; we need to initiate a sustained, significant program to make some important changes. There are some things that the new President can do, especially as they relate to the military, law enforcement, and some other agencies in the Executive Branch. This is potentially cause for some glimmer of hope. I intend to blog some on that too, with a list of things that should be considered in the new administration. This story (somewhat long) is about Senator Barack Obama’s summit session at Purdue University today (Wednesday, July 16). on security challenges for the 21st century. I managed to attend, took notes, and even got my name mentioned. Here’s the full story. Monday night, I received email from a colleague here at Purdue asking if I could get her a ticket to see Senator Obama on campus. I was more than a little puzzled — I knew of no visit from the Senator, and I especially didn’t know why she thought I might have a ticket (although there are people around here who frequently ask me for unusual things). Another exchange of email resulted in the discovery that the Senator was coming to Purdue today (the 16th of July) with a panel to hold a summit meeting on security issues for the 21st century. Cyber security was going to be one of the topics. The press was told that Purdue was chosen because of the leading role our researchers have in various areas of public safety and national security — including the leading program in cyber security — although some ascribed political motives as the primary reason for the location. I found it rather ironic that security would be given as the reason for being at Purdue, and yet those of us most involved with those security centers had not been told about the summit or given invitations. It appears that the organizers gave a small number of tickets to the university, and those were distributed to administrators rather than faculty and students working in the topic areas. I found this all very ironic and interesting, and expressed as much in email to several friends and colleagues — including several who I knew had some (indirect) link to the Senator’s campaign. I had faint hope of getting a ticket, but was more interested in simply getting the word back that there was a misfire in the organization of the event. Late last night (I was in the office until 6:30) I got a call from someone associated with the Obama campaign. He apologized for the lack of an invitation, and informed me that a ticket was awaiting me at the desk the next day. I went over to the Purdue Union at 11:30; the official event was to start at 12. I encountered a number of Purdue administrators in the crowd. Security was apparent for the event, including metal detectors at the door run by uniformed officers, some of whom I believe were with the Secret Service uniformed division. The officers everywhere were polite and cheerful, but watchful. I found a seat in the back of the North Ballroom with about 500 other guests…and nearly as many members of the press, entourage, ushers, protection detail, and so on. I won’t try to summarize everything said by the Senator and panel — you can find the full video here (in two parts). I will provide some impressions of specific things that were said. The event started almost on time (noon) with Senator Evan Bayh introducing Senator Barack Obama. Sen. Obama then read from a prepared set of remarks. His comments really resonated with the crowd (I encourage you to follow the link to read them). His comment about how we have been “fighting the last war” is particularly appropriate. He made some very nice comments about Senator Richard Lugar, the other Senator from Indiana. Senator Lugar is a national asset in foreign policy, and both Senators Obama and Bayh (and former Senator Nunn) had nothing but good things to say about him — and all have worked with him on disarmament and peace legislation. One of the lighter moments was when Senator Obama said that Senator Lugar was a great man in every way except that he was a Republican! Early in his statement, he deviated from his script as reproduced in the paper, and dropped my name as he was talking about cyber security. I was very surprised. He referred to me as one of the nation’s leading experts in cyber security when he mentioned Purdue being in the lead in this area. Wow! I guess someone I sent my email to pushed the right button (although my colleagues and our students deserve the recognition, as much or more than I do). His further comments on officially designating the cyber infrastructure as a strategic asset is important for policy & legal reasons, and his comments on education and research also seemed right on. It was a strong opening, and there was obviously a lot in his comments for a number of different audiences, including the press. The first 1/3 of the panel discussion was on nuclear weapons issues. The experts present to talk on the issue were (former) Senator Sam Nunn (who joked that in Indiana everyone thought his last name was actually Nunn-Lugar), Senator Bayh, and Dr. Graham Allison, the director of the Belfer Center at Harvard. There was considerable discussion about the proliferation of nuclear materials, the need for cooperation with other countries rather than ignoring them (viz. North Korea and Iran), and the control of fissionable material. There were some statements that I found to be a bit of hyperbole: For instance, the statement that a single bomb could be made by terrorists to destroy a whole city. Not to minimize the potential damage, but without sophisticated nation-state assistance and machining, a crude fission weapon is about all that a terrorist group could manage, and it wouldn’t be that large or that easy to build. A few tens of kilotons of fission explosion could definitely ruin your day, but a detonation at ground level wouldn’t destroy a whole city of any size. (Lafayette, IN would be mostly destroyed by one, but that isn’t a major city.) Plutonium is too dangerous to handle, so over 100 pounds of U-235 (or U-233) would be needed, and machined appropriately, for such a weapon. Without accelerators and specially shaped charges & containers, getting fission fast enough and long enough is difficult and….well, there is a very serious threat, and the nuances may be lost on the average crowd, but the focus on terrorists building a significant bomb seemed wrong to me. There were some excellent remarks made about opportunity cost. For instance, the one figure that stood out was that we could fully fund the Nunn-Lugar initiative and some other plans to secure loose nuclear materials by spending the equivalent of 1 month of what we now spend in Iraq over the next 4 years around the world; the war in Iraq is breeding terrorists and making US enemies, while securing loose nukes would help protect generations to come around the world. As both a taxpayer and a parent (as well as someone immersed in defense issues), I know where I would prefer to see the money spent! One other number given is that currently less than 1/4 of 1% of the defense budget is spent on containing nuclear materials, despite it being a declared priority of President Bush. Professor Allison said that despite grade inflation at Harvard, the President still gets an “F” in this area. Another interesting factoid stated was that about 10% of the lights in the US are powered by electricity generated from reprocessed fissile material taken from Russian nukes rendered safe under the Nunn-Lugar initiative. That sounds high to me given the amount of nuclear power generated in the US, but even if off by a factor of 10, darned impressive. The second part of the panel was on bio weapons. The panelists were Dr. Tara O’Toole of the Center for Biosecurity at Pitt, and Dr. David Relman of Stanford. Their discussion was largely what I expected, about how bio-weapons can be produced by rogue actors as well as rogue states. They made the usual references to plague (with a funny interchange about prairie dogs being carriers, and keeping the Senator’s campaign away from them), anthrax and Ebola. Again, there was a bit of exaggeration coupled with the dialog. It was pointed out that there has still been no apprehension of the perpetrator of the 2001 anthrax attacks. It was then stated that the anthrax in the envelope sent to Senator Daschle was enough to kill a billion people. No mention was made about how impossible it would be to meter and deliver such dosages in the most appropriate manner to achieve that. In fact, no discussion was made about the difficulty in weaponizing most biological agents, limiting their use as a targeted weapon over a large area. And furthermore, no mention at all was made of chemical weapons. The conclusion here was that investment in better research and international cooperation was key. The statement was made that better integration of electronic health records would be important, too, although some studies I recall indicate that their utility is probably not so great as some would hope. It was also concluded that benefits in faster medical response and better vaccine production would help in non-crisis times as well. I don’t think we can argue too much with that, although the whole issue of how we pay for medicine and health issues looms large. The last panel featured Alan Wade, former CIO of the CIA, and Paul Kurtz of Good Harbor Consulting, speaking on the cyber threat. I’ve known Paul for years, and he is a great person to talk on these issues. 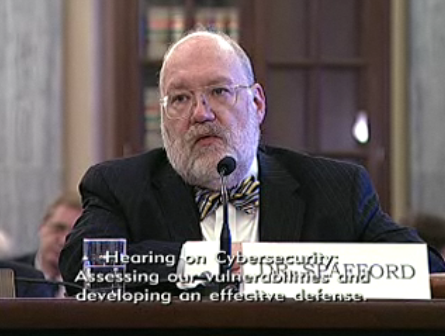 The fact that cyber technology is universal and ubiquitous was highlighted. So was the asymmetry inherent in the area. Some mention was made about how nothing has been done by the current administration until very recently. Sadly, that is clearly the case. The National Strategy in 2002, the PITAC report in 2005, and the CSTB report in 2007 (to name 3 examples) all generated no response. As a member of the PITAC that helped write the 2005 report, I was shocked at the lack of Federal investment and the inaction we documented (I knew it was bad, but didn’t realize until then how bad it was); the reaction from the White House was to dissolve the committee rather than address the real problems highlighted in the report. As one of today’s panelists put it — the current administration’s response has been “…late, fragmented, and inadequate.” Amen. I was disappointed that so much was said about terrorism and denial of service. Paul did join in near the end and point out that alteration of critical data was a big concern, but there was no mention of alteration of critical services, about theft of intellectual property, about threats to privacy, or other more prominent threats. Terrorism online is not the biggest threat we face, and we have a major crisis in progress that doesn’t involve denial of service. We need to ensure that our policymakers understand the scope of the threat. Paul pointed out the need for more funds for education and research. He also made a very kind remark, mentioning me by name, and saying how we were a world-class resource built with almost no funding. That’s not quite true, but sadly not far off. I have chafed for years at how much more we could do with even modest on-going support that wasn’t tied to specific research projects…. Senator Obama is a great orator. I also noticed how his speed of presentation picks up for the press (his opening remarks) but became more conversational during the panel. Senator Obama kept bringing the panel back to suggestions about what could be done to protect the nation. I appreciated that focus on the goal. He also kept returning to the idea that problems are better solved early, and that investments without imminent threat are a form of insurance — paying for clean-up is far greater than some prudent investment early on. He also repeatedly mentioned the need to be competitive in science and technology, and how important support for education is — and will be. After the session was over, I didn’t get a chance to meet any of the campaign staff, or say hello to Paul. I did get about 90 seconds with Senator Bayh and invited him to visit. After my name had been mentioned about 3 times by panelists and Senator Obama, he sort of recognized it when I introduced myself. We’ll see if he follows up. I’ve visited his office and Senator Lugar’s, repeatedly, and neither have ever bothered to follow up to see what we’re doing or whether they could help. Several people in the audience commented on my name being mentioned. I’m more than a little embarrassed that they didn’t refer to CERIAS and my colleagues, and in fact I was the only Purdue person mentioned by name during the entire 2 hours, and then it happened multiple times. I’m not sure if that’s good or not — we’ll see. However, as P.T. Barnum said, there’s no such thing as bad publicity … so long as they spell my name correctly. None of the local or national press seem to have picked it up, however, so even spelling isn’t an issue. The press, in fact, hasn’t seemed to focus on the substance of the summit at all. I’ve read about 15 accounts so far, and all have focused on his choice of VP or the status of the campaign. It is so discouraging! These are topics of great importance that are not well understood by the public, and the press simply ignores them. Good thing Angelina Jolie gave birth earlier in the week or the summit wouldn’t have even made the press. I wish more of the population would take the time to listen to prolonged discussion like this. 15-second sound bites serve too often as the sole input for most voters. And even then, too many are insufficiently educated (or motivated) to understand even the most basic concepts. I wonder if more than 5 people will even bother to read this long a post — most people want blogs a single page in length. As for my own political opinions and voting choices, well, I’m not going to use an official Purdue system to proselytize about items other than cyber security, education, research and Purdue. You can certainly ask me if you see me. Now, if only I had confidence in the electronic voting equipment that so many of us are going to be forced to use in November (hint: I’m chair of the USACM). And no, I’m not particularly interested in the VP position.